Director – Francis Lawrence, Screenplay – Kevin Brodbin & Frank Cappello, Story – Kevin Brodbin, Based on the Comic Book Hellblazer by Jamie Delano & Garth Ennis, Producers – Lorenzo Di Bonaventura, Akiva Goldsman, Benjamin Melniker, Lauren Shuler Donner, Erwin Stoff & Michael E. Uslan, Photography – Philippe Rousselot, Music – Klaus Badelt & Brian Tyler, Visual Effects Supervisor – Michael Fink, Visual Effects – CIS Hollywood, ESC Entertainment (Supervisors – George Murphy & Greg Strause), HATCH Productions, Hydraulx & The Tippett Studio (Supervisor – Craig Hayes), Makeup Effects – The Stan Winston Studio (Supervisors – Shane Mahan & John Rosengrant), Production Design – Naomi Shoban. Production Company – The Donners Company/Weed Road Pictures/Batfilm Productions/3 Arts Entertainment/Lonely Film GmBh and Co KG. John Constantine is an exorcist living in Los Angeles. Since he was a child, Constantine has had the gift of being able to see supernatural entities. Driven mad by these visions, he attempted to commit suicide and was consigned to Hell, the place where suicides go, only to be sent back. Subsequently he has been attempting to earn passage into Heaven by dispatching the forces of darkness. He is now baffled by the appearance of demons on Earth, as they are bound as part of their agreement with Heaven to not physically manifest but only be able to influence at a distance. He is approached by police detective Angela Dodson who believes that her twin sister Isabel’s fall from a roof was not a suicide but due to malign influence. They are thrown together as Constantine learns that the forces of darkness have uncovered an all-important artefact The Spear of Destiny that will allow Satan to give birth to a son on Earth. Constantine realises that somehow Angela is a crucial part of the plan. 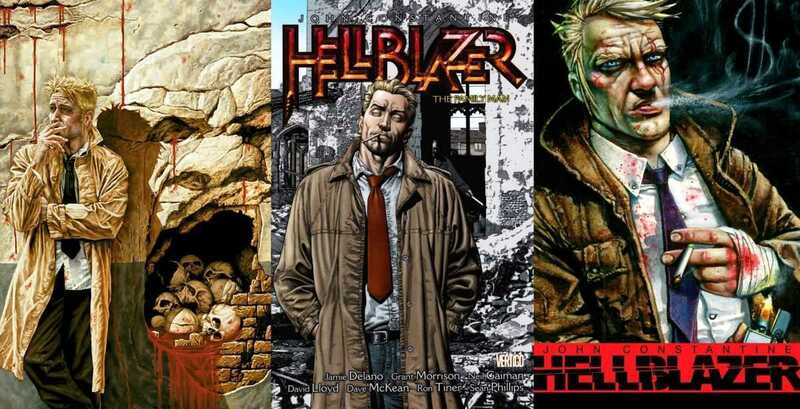 For those confused by the change of titles, Constantine is a film adaptation of the DC/Vertigo comic-book series Hellblazer. (The title of the film was apparently changed from Hellblazer to avoid confusion with Hellboy (2004), another comic-book adaptation that was made around the same time, which also dealt with the battle against demonic forces). This in itself is not necessarily a bad thing – after all the original comic-book had been titled Hellraiser but underwent a name change to avoid confusion with the Clive Barker film Hellraiser (1987) but it does ominously presage an overall attitude that besets Constantine – of taking a cult comic-book and then discarding most of the essentials. John Constantine had his origins as a supporting character in DC’s Swamp Thing, first appearing in Swamp Thing #37 in 1985, written by no less than comics legend Alan Moore, known for other works become films such as From Hell (2001), The League of Extraordinary Gentlemen (2003), V for Vendetta (2006) and Watchmen (2009). Constantine appeared throughout Swamp Thing over the next few years where he was an ambiguous figure with great occult knowledge but was also shown as a sly conman who did not always stand on the side of right. Due to reader popularity, Constantine was finally granted his own title with Hellblazer, which appeared in January of 1988. It was here that Constantine’s background, which had only been hinted as throughout Swamp Thing, began to become apparent. Throughout Hellblazer, we learned that Constantine was born in Liverpool – indeed the inspiration for Constantine is widely acknowledge by the original artists as being the rock star Sting – and developed an interest in the occult from an early age. Formative on his chosen career path was an exorcism in Liverpool that went wrong, ending with a young girl being sent to Hell. One might notice when it comes to the film version that almost all of these basic details have been thrown out. John Constantine is no longer from Liverpool but has become a generic Los Angeles native. He is no longer blonde and modelled on Sting but played by Keanu Reeves (an earlier version of the film held the even more disastrous promise of the part being played by Nicolas Cage). Constantine is no longer an ambiguous character and conman but a standard burned-out Hollywood hero. Moreover, Keanu Reeves’s characteristically flat delivery, which admittedly better than usual, makes the wry, cynical humour the character had on the printed page fall flat on screen. The character’s background has also been rewritten. What we have is not so much a case of changing the odd detail of a comic-strip to appeal to a broader audience – a la Judge Dredd (1995) and the Helmet Controversy – but something more along the lines of Catwoman (2004) where the writing team has decided that they know best and ditched almost all of the details of the original and come up with something else altogether. All of which leads one to say, if you are going to adapt a cult source work, why bother if you are going to throw out everything that is going to get those all-important fans and their crucial word-of-mouth into the seats? Why not simply invent a completely original story? Even considered on its own terms, Constantine has an undeniable promise. The trailers held the immensely exciting idea of the dark and moody modern superhero a la Batman (1989) having been conceptually blended with The Exorcist (1973). Or even more so than The Exorcist, with The Prophecy (1995) and its ambitious idea of a war between Heaven and Hell – there are many similarities between Constantine and The Prophecy, particularly in the plot concerning a fallen angel’s plan to influence the angel/demon war and the use of Satan as a Seventh Cavalry coming to save the day. The script creates a wonderful sense of its own demonic mythology that is at times not unlike Warlock (1989) and its creation of an occult pseudo-mythology based on taking old wives’ cant seriously – with images of Keanu Reeves holding a cat and sitting in a chair with his shoes in a tub of water as a way of venturing down into Hell and his later attempt to drown Rachel Weisz in a bath so that she can obtain a glimpse; an exorcism that involves trapping a demon inside a mirror and dropping it from a window; the club for occultists where entry is only granted by reading the Zener card that the bouncer is holding up; the handy use of a sprinkler system to disperse holy water in a roomful of demons. On the other hand, these scenes sit alongside images of the distinctly schlocky – of Keanu Reeves wading into combat dispatching demons with silver bullets from a combination crucifix-tommy gun. It is images like these that make Constantine seem less the promising film that it could have been – a dark, glistening graphic novel incarnated in brooding Gothic glory – than a comic book adaptation that sits down around the level of Spawn (1997), Legion (2010) or Drive Angry (2011) where theological depth amounts to no more than the exorcist as a gun wielding hero. One suspects on its own, the script (even though it dismisses the source work almost entirely) might have held the potential for a decent film. The main problem with Constantine is more its director Francis Lawrence. Lawrence had previously made a name directing music videos – for everyone from Janet Jackson, Avril Lavigne, Jennifer Lopez, Alanis Morrissette and Britney Spears to Justin Timberlake – and Constantine was his feature film debut. Despite Lawrence’s clear skill directing visually flashy MTV clips, little of that translates here and Constantine emerges as exactly what it is – a novice effort by a director who seems remarkably unattuned to either mood or performances. This is a film where the entire difference between it being a good and a disappointing film could have rested in the director reducing the lighting level by about a quarter and focusing on the inner drive of the characters. 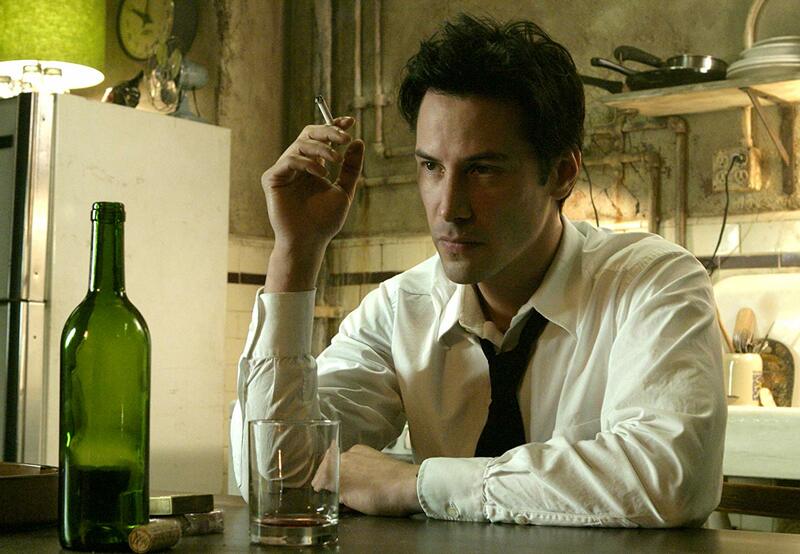 I expected Constantine was going to come out looking somewhere between The Crow (1994) and Keanu Reeves’ previous hit, The Matrix (1999). Alas, Francis Lawrence has chosen to go with a nondescript visual look and two of the most inexpressive actors in the business – the characteristically wooden Keanu Reeves and Rachel Weisz. Constantine is also regrettably a film where Francis Lawrence seems to prefer pop-up CGI effects rather than the establishment of anything approaching mood. We get these throughout with almost routine regard – demon attacks in the street, Keanu Reeves brawling with a demon composed of bugs. Those and set-pieces at seemingly timed intervals where Constantine’s assistants are dispatched in various ways. 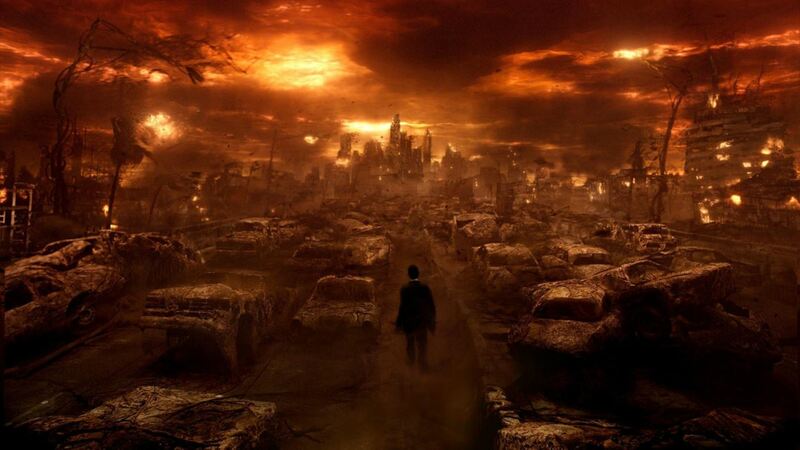 There is the odd striking image – a wide-angle of the possessed Mexican scavenger walking through a field of cattle causing them to collapse dead in his wake; the vision of Hell as an street scene that looks like L.A. about three seconds after it was hit by the nuclear weapon in Terminator 2: Judgment Day (1991). To Francis Lawrence’s credit, Constantine comes into its own somewhat at the climax, which features a complex plot of afterlife machinations (even if the basic idea is stolen from The Prophecy) and the show being stolen in large part by Peter Stormare’s entertainingly over-the-top performance as Satan. However, the rest of the show falls flat in terms of mood, in terms of anything resembling the brooding Gothic vision of the comic-book, even in terms of exciting action. The character of John Constantine later became the basis of the tv series Constantine (2014-5) starring Matt Ryan in the title role, which did a far better and more faithful job of capturing the essence of the comic-book, although this was cancelled after only thirteen episodes. Ryan’s Constantine was however later crossed over in an episode of Arrow (2012– ) and then became a recurring guest actor and later a regular in Legends of Tomorrow (2016– ), while Ryan also voices the role of Constantine in the animated Justice League Dark (2017) and the animated web series Constantine: City of Demons (2018), which was later compiled as a film. Francis Lawrence next went onto make the high-profile last man on Earth film I Am Legend (2007), the non-genre circus film Water for Elephants (2011) and next took over The Hunger Games franchise with The Hunger Games: Catching Fire (2013), The Hunger Games: Mockingjay Part 1 (2014) and The Hunger Games: Mockingjay Part 2 (2015), followed by Red Sparrow (2018). He has also directed the tv pilot Gotham (2012) about a female detective drawn into a magical version of New York City, as well as produced the alternate world political drama tv series Kings (2009) and the tv series Touch (2012-3) about a father whose son can predict the future.